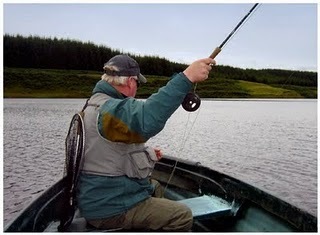 ← A Spot Of Burn Fishing. Hillend Dabbler – cracks Glengavel with Monster Broonie!!! Organized a visit to Glengavel for a celebrity angler recently the “Hillend Dabbler” who writes a great blog – The Hillend Dabbler. Please read his post below & check out on his Blog page – all i can say is well done Allan!!! Thanks also for letting us use your photos and words in this post. Hillend Dabbler with his Cracking Broonie. 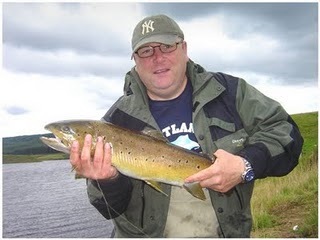 I had wanted to visit Glengavel reservoir for a few weeks now ever since I came across the Upper Avon Angling Association web site and got in contact with their Club Secretary, Alby. Every now and again I was getting takes but I kept on missing them, then eventually there was a splash at my Kate and this time it was on. After a feisty fight I landed a trout of ¾ of a pound. After a quick pic I released him back to his natural habitat. Time was getting on and Alan had to leave to collect his kids from school so after rowing back down to the fishing hut. We said our goodbyes and I thanked him for taking me out on the boat. I decided to take a break and have lunch. Then after having a wander around taking photos I decided to try for some trout again. 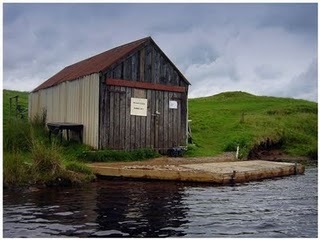 I opted to fish down into the wee bay from the fishing hut and waded out up to about my waist. I wasn’t fishing very long when I got a very ferocious take, this felt good. A great struggle ensued as I tried to gain some semblance of control. As I was starting to get the upper hand with this fish another Glengavel angler arrived and watched me bring this fantastic fish to the shore. He remarked that this was a beauty and estimated it to be around the 5lb mark at least. He assisted me with his net and I brought the fish ashore and found that this big broonie had been fooled by my ever-faithful companion, Katey once again. After a quick photo shoot with me and the fish I released the bigyin back to whence he came. 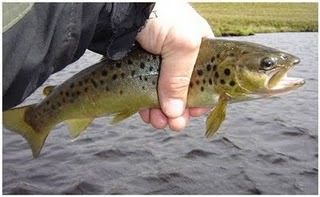 The Glengavel Regular [I never caught his name] shook my hand and congratulated me and was soon off looking for trout. I decided to stop fishing and just sit back and enjoy the moment and satisfaction that every angler experiences after such a fish. I could have packed up there and then, I was that contented. After a quarter of an hour or so I headed for the Sandy Bay but casting was difficult in the ever-increasing wind. No further action occurred so I made my way back to the hut to sign out, but before doing so I had a few final casts near the hut. As I packed up I reflected on a very satisfying day out at Glengavel. The fishing was great but what pleased me more than anything was the genuine friendliness and hospitality of everyone I met today… Jim, Alan and The unknown angler. I would also like to thank Alby who I have only met and spoke to “virtually” on the net, who arranged everything for me. Thank you very much, I had a fantastic day. One Response to Hillend Dabbler – cracks Glengavel with Monster Broonie!! !